FIGURE 10.26. (A) Peripheral compartment viewing superiorly. 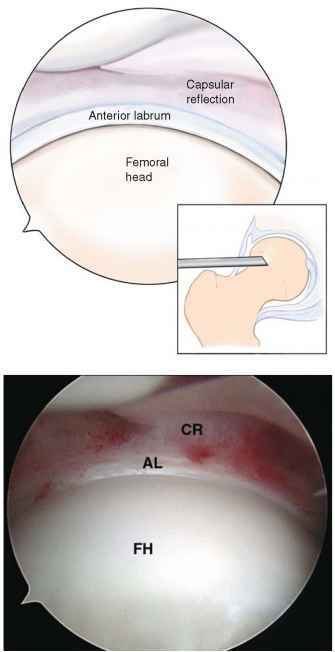 (B) Demonstrated is the anterior portion of the joint including the articular surface of the femoral head (FH), anterior labrum (AL), and the capsular reflection (CR). degeneration that may have predisposed to the acute tear. Also, there will often be some accompanying articular damage. The extent of this may be a significant influencing factor on the eventual response to debridement. FIGURE 10.27. 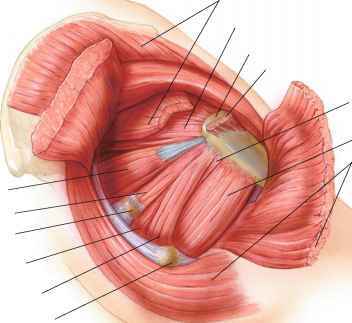 The cleft identified by the probe sometimes separates the margin of the acetabular articular surface (A) from the labrum (L). This is a normal variant without evidence of trauma or attempted healing response. tissue. The most difficult aspect is usually creating the stable transition zone. 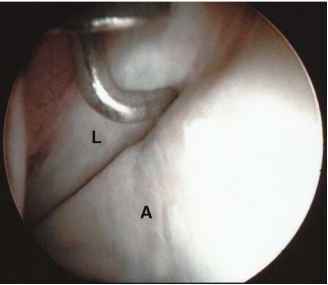 Thermal devices have been quite useful at ablating unstable tissue adjacent to the healthy portion of the labrum. Caution is necessary because of the concerns regarding depth of heat penetration, but with judicious use, these devices have been exceptionally useful for precise labral debride-ment despite the constraints created by the architecture of the joint. FIGURE 10.28. The physeal scar (arrows) is an area devoid of articular surface that may extend posteriorly from the acetabular fossa (as shown here) or anteriorly, demarcating the area of the old trira-diate physis.